2019 is a fantastic year to visit Asia's Lion City, not least because it's this cosmopolitan destination's 200th birthday. Here, we share seven fantastic things to do in the sky-high city of stunning Singapore on any visit. Sail into Singapore: as the world's only island-country-city, what better way to arrive than by ship? Check out the latest deals on cruises to Singapore with Marella to secure your next seafaring voyage for less. In 2019, Singapore will become the first Asian destination to host the World's 50 Best Restaurants awards. And it's hardly surprising - Singapore has everything from Michelin-starred fine dining to some of Asia's best street food. Eating well here doesn't require a second mortgage, either. One of the most popular Michelin-starred venues is Liao Fan, a street food stall in Chinatown, and in 2018, 17 restaurants and hawker stalls were added to the Michelin Guide's Bib Gourmand list - Michelin's guide to great food at moderate prices. Our favourite wallet-friendly place to chow down is Straits Kitchen at The Grand Hyatt Singapore, with its legendary street food-inspired buffet. 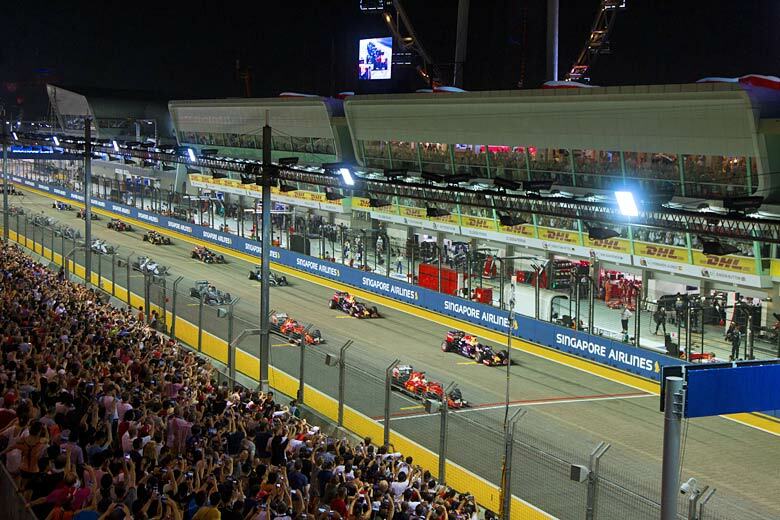 You don't have to be an F1 fan to enjoy the spectacular night race which takes place every September (22nd September in 2019). Singapore's public roads double as the Grand Prix track, so once the race is over you'll be able to drive the course yourself. But the reason Singapore is the most popular race on the F1 calendar is the after-party: every night for three nights, some of the world's biggest acts take to the stage. In recent years, The Killers, Katy Perry, Justin Bieber and Ariana Grande have all performed there, and although the exact line-up for 2019 is yet to be confirmed, we know it will include Fat Boy Slim and Muse. 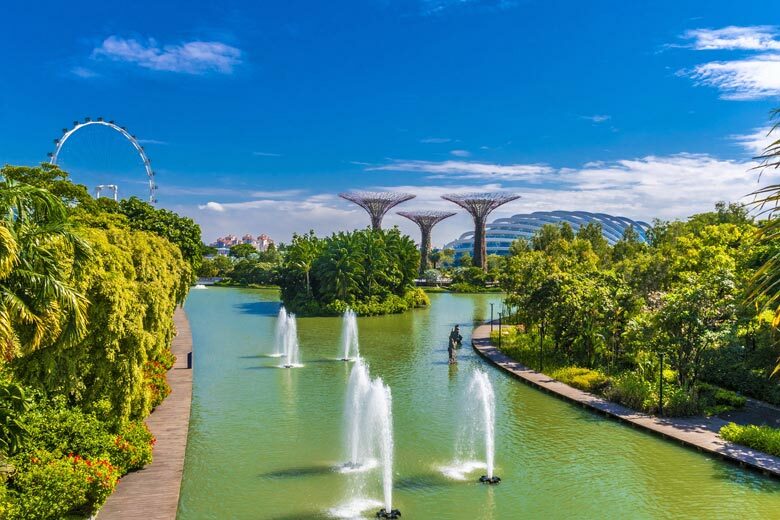 Singapore is one of Asia's greenest cities. Not convinced? Hop on a bike (the bright yellow Ofo Bikes are ace) and tackle the Park Connector Network. This route winds between the Singapore's wildest green spaces, including Windsor Nature Reserve, with its lakes and collections of native plants, and MacRitchie Reservoir, home to monkeys, monitor lizards and flying lemurs. Even the urban areas have a rural feel. Singapore has the second-highest number of green buildings of any city in the world, and if things go to plan, 80 percent of its buildings will be green ones by 2030. Awards aren't everything, but the fact that Singapore was the first destination to host the newly-created Asia's Best Bars awards in 2018 (and will host it for the next two years) suggests the destination's bar scene is also a cut above. If that's not enough, it's also due to host the World's 50 Best Bars awards in 2021 - the first time the event will be hosted outside of London. Don't miss Manhattan Bar at The Regent Singapore, with its classic cocktails and New York-style glamour - think huge Chesterfield sofas and velvet drapes - and, for the beer drinkers, LeVeL33 - the world's highest microbrewery. There's a common misconception that Singapore is a little on the sterile side. However, we'd bet good money that those most likely to utter it are travellers who've simply spent long stopovers at the airport or, worse still, have never been. In reality, Singapore is anything but. 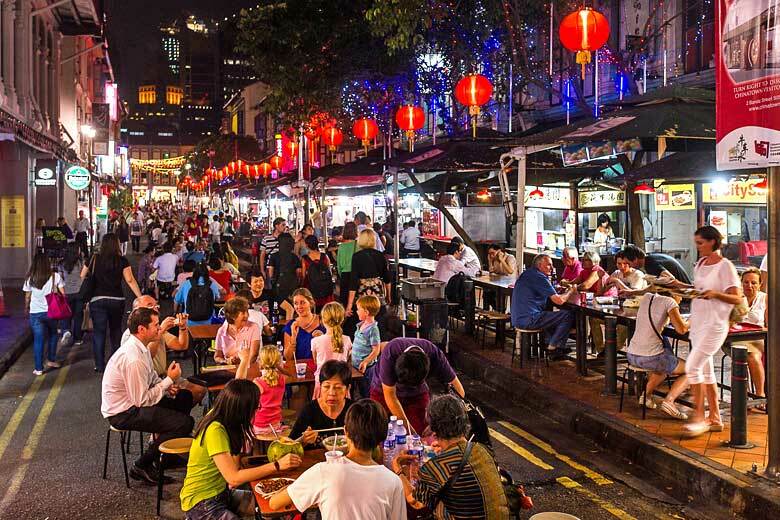 Make for colourful and chaotic Little India for a slice of Mumbai in the heart of Singapore; try the historic foodie enclave of Balestier Road for traditional street food or head to achingly hip Holland Village for some of Singapore's quirkiest boutiques. Got a sweet tooth? A popular spot for a late night sugar fix is pastry chef Janice Wong's award-winning 2am:dessertbar. 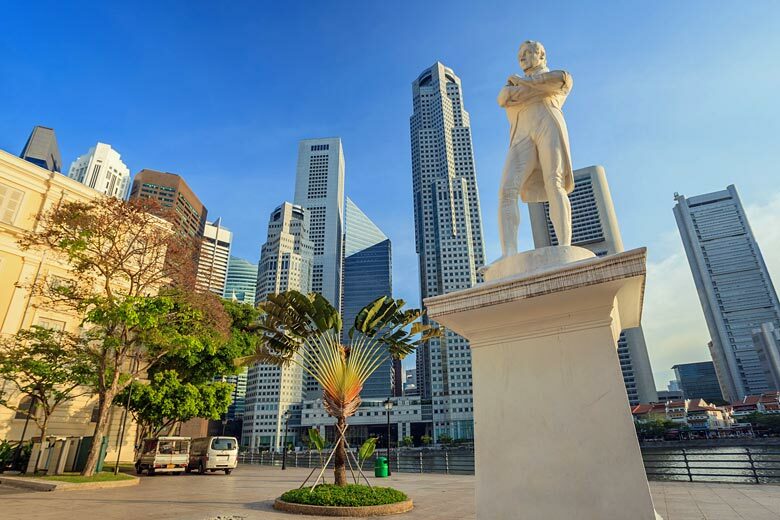 This year marks Singapore's bicentennial - 200 years since its founder, Sir Stamford Raffles, arrived there, transforming a jungle-covered island by securing it as a base for trade on the all-important route between India and China. Head to Fort Canning Centre to discover what went before (yes, there was even a "before"), including the fearsome Orang Laut tribe who lived here in the 1400s, and Chinese trader Wang Dayuan, who arrived here in the 1330s, and whose observations provided historians with an invaluable insight into the history of the region. For example, it's just a one-hour ferry ride from Singapore to the beautiful Indonesian island of Bintan, and it's possible to catch a train from Singapore to a wide range of destinations in nearby countries. This includes Kuala Lumpur and Penang in Malaysia, and Bangkok in Thailand. Flying to Jakarta, Indonesia's capital, takes two hours, and it takes just over two hours to get to the Vietnamese capital of Ho Chi Minh. The best bit? These journeys can be ridiculously cheap. Expect to pay around £40 for a return to Ho Chi Minh, and £5 for the ferry journey to Bintan, Indonesia. One big benefit of living near the equator is that it never gets cold. 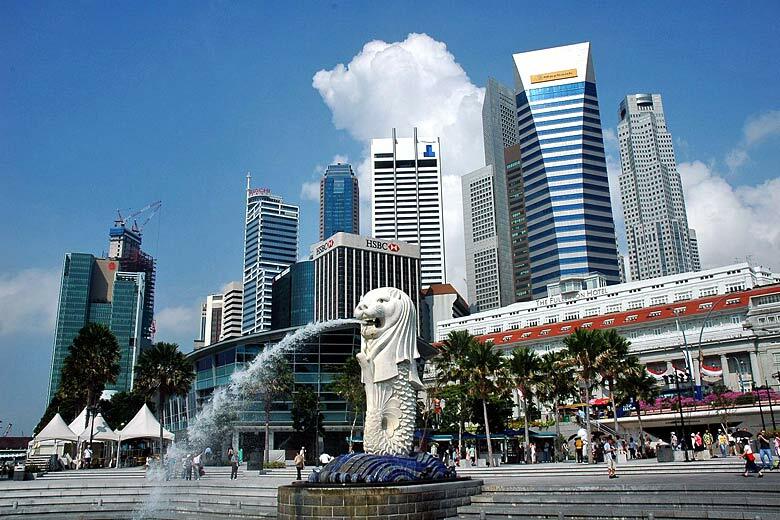 The weather in Singapore is warm and humid all year round, and the mercury rarely dips below 22°C or rises above 33°C. If you're visiting between March and October, however, be aware that heat and humidity is higher during these months. The rainiest period is between October and January, but showers are normally short, sharp affairs. As well as the climate guide above, you can also see when we think is the very best time to go to Singapore to experience everything this enchanting city has to offer. Keen to experience the best of Singapore? While you can easily fly to this magnificent metropolis, why not book a cruise and tie a stop in Singapore into a wider, longer adventure at sea? Don't miss the latest deals on cruises with Marella in 2019/2020.